Our team is currently assisting community leaders in 13 counties in Texas, and two in Kansas. Some of the biggest challenges the leaders face is simply getting people together. And although that doesn’t sound like a difficult task, it has been incredibly challenging in Texas since the geographical area affected was so widespread. As disaster recovery organizations are spread thin, it has also been difficult to find long-term resources to help repair and build homes. Several organizations have come to the aid of these communities, but if you have been considering volunteering, now is a great time to do so. For information about volunteer opportunities, please visit the National Voluntary Organizations Active in Disaster (NVOAD). As Texas communities shift focus to long-term recovery following Hurricane Harvey, our team continues to work with long-term recovery groups (LTRG) across southeast Texas. We are excited to announce that we have received funding so that we can continue to support these communities long-term. 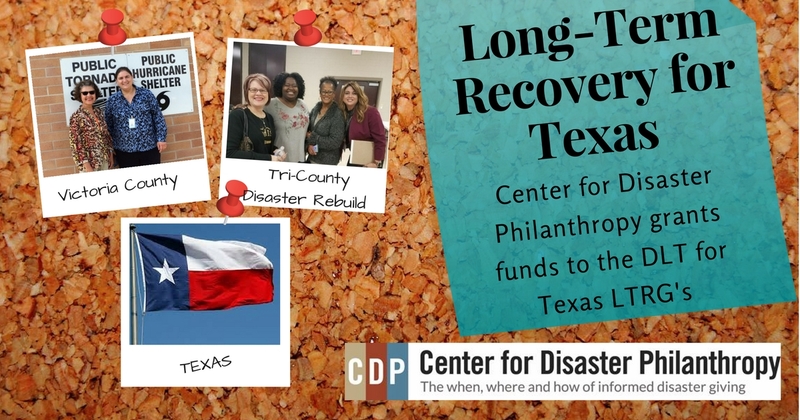 The funds, provided by the Center for Disaster Philanthropy (CDP) Hurricane Harvey Recovery Fund, will allow our team to continue to support the Texas Long-Term Recovery Groups we are currently working with and to be able to respond to any additional Texas communities that may need assistance. One of the most exciting aspects of this funding is that we will be about to develop an online searchable database of long-term recovery forms. The forms can be used by LTRG’s in their recovery. This database has been a focus of our team since our formation in 2016. It is an element we all feel will greatly contribute to the success of any community recovering from a disaster. The database will be created by our team members over the next several months. It will be available for communities so that they will not need to track down this information on their own. We are grateful for the support from the Center for Disaster Philanthropy’s Hurricane Harvey Fund. Thank you to all of the supporters who made this fund possible. We will share success stories and updates through our website and social media as well as through the CDP website. It's very likely that unless you have been part of recovery from a disaster you would know what this term means and you may even be so savvy to know what the acronym represents – Long Term Recovery Group. It can also take the form of a Committee (LTRC). 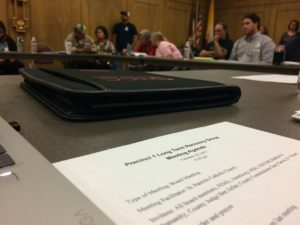 But most people have no idea how recovery works or how it's supposed to work, but it is an essential organization for a community to return to a ‘new normal’ following a disaster. First off, as the name suggests, it's LONG. There is no magic formula to figure out how long recovery will take a community, believe me we asked for it many times, but when your neighbors are living in unsafe conditions or are in a continual downward spiral because they just need to be home, you begin to ask yourself how long is this going to take?? Let’s get this show on the road. Most of the time, an LTRG forms around the time the community's basic infrastructure has been restored. This group can take many shapes according to the resources available and who decides to come to the table. Usually community members and people from non-governmental organizations (NGO’s), businesses and faith-based organizations begin to meet and answer and address the most pressing issues facing the community. • Who are the volunteer organizations helping or who can we ask to help? • Who in our community is struggling? • What resources do we have available including funding and most importantly…. • How are we going to get our community back? When this groups begins to come together, our team members are available to help fit the pieces together and provide perspective on what the road looks like ahead. Having someone there to provide guidance and give emotional support, helps to boost community leader's confidence and belief that they will make it through recovery. Having worked in many communities across the west, Mennonite Disaster Service (MDS) Regional Operations Coordinator Jeff Koller was all too familiar with the strain and stress disaster recovery leaders live with each day. As MDS worked toward meeting people’s needs, leaders he met were feeling the effects of secondary trauma. One such leader, Chris Files from Bastrop, Texas, had been through two wildfires, three floods, and a tornado – all in 5 years. When MDS asked her if there was anything else they could do to help, she asked if she could talk with people who had similar experiences. MDS decided to gather disaster leaders to support one another and share previous experiences. In September of 2016, MDS held a symposium in Wichita, KS which was attended by 7 disaster recovery leaders from 7 states. Meeting together in person and hearing what everyone had been through was both heartbreaking and eye-opening. Wildfires, tornadoes, mudslides, and floods all have very different effects on the communities they strike, yet the process of getting back to a new normal is surprisingly similar. ‘Our disasters’ ranged from very small communities to large ones but had many common threads, including extreme situations of loss. In 2011, an EF5 rated tornado came through Joplin, MO and killed 158 individuals, injuring more than a 1,000 and causing damages of $2.8 billion. Stephanie Brady and Renee White came to the aid of their community and listened to neighbors, learned about FEMA duplication of benefits, and took part in endless hours of meetings to get needs met all while trying to balance family and self-care. Some leaders, like Carlene Anders, had functioned in multiple roles. She was elected Mayor, serves her community as a firefighter, and also as the Executive Director of the Okanogan Long-Term Recovery Group following devastating wildfires in her town of Pateros, WA. One thing became clear, this group of disaster veterans and masters of recovery were committed to helping others in similar situations. At the end of the weekend, the group decided to move forward with establishing a team of disaster recovery mentors who could support and guide communities new to disaster navigate their recovery. Since that symposium, the group has become a dedicated team of 10 disaster recovery leaders supported by an extraordinary advisory committee and board of directors. The team is grateful to MDS for bringing them together so they can now pay it forward.